It really wasn't too long ago that Anthony Pettis was the best lightweight in the world. It was 2010 when Pettis defeated Benson Henderson to win the WEC lightweight title, landing his trademark "Showtime Kick" in the process, and he then went on to win the UFC lightweight title in a rematch with Henderson in 2013. A title defense against Gilbert Melendez in 2014 followed, and it at that point it looked like Pettis was unstoppable. Fast forward to 2017, and it feels like Pettis' days at the top were decades ago. Since defeating Melendez, Pettis has gone 2-5, and looks like a shell of his former self. While Pettis was once clearly one of the top pound-for-pound fighters in the sport, he's now barely clinging onto a roster spot. Pettis' fall from grace started with his second title defense against Rafael dos Anjos in 2015. RDA entered the fight as a massive underdog as almost everyone expected Pettis to smoke him. 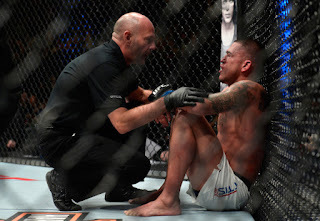 But RDA came into the fight with a great gameplan, and was able to take Pettis down to the mat and beat him up for 25 minutes to take the title. He also busted Pettis' orbital bone with ground-and-pound, and since that eye injury it just seems like Pettis hasn't looked the same. Pettis followed up the one-sided defeat to RDA with a close decision loss to Eddie Alvarez. Obviously there's no shame in losing to either of those fighters, but Pettis didn't look particularly good in either fight. Another lopsided decision loss to Edson Barboza gave Pettis a three-fight losing streak, and it sent Pettis packing to 145. Pettis started off his featherweight run with a submission win over Charles Oliveira to earn himself an interim title shot against Max Holloway, but that didn't go according to plan, as Pettis was beaten badly by Holloway en route to suffering his first career TKO loss. He also missed weight for the fight, and afterwards admitted he could no longer make 145 safely, so he would be moving back to 155. 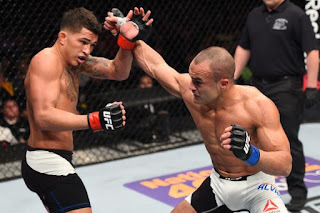 A decision win over veteran Jim Miller in his lightweight return put Pettis back in the spotlight, and he earned himself a main event against Dustin Poirier at UFC Fight Night 120, which took place this past Saturday in Norfolk, Virginia. 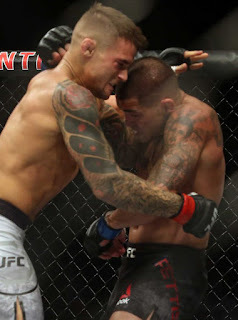 Pettis was once again favored like he almost always is, but he was dominated by Poirier for three rounds before finally tapping out due to a rib injury. Pettis took a ton of damage in the fight, and afterwards Poirier called him "a broken man." Powerful words, but it's hard to say Poirier is wrong. Although Pettis is only 30, he's looked quite bad in his recent performances all things considered, and not even close to the fighter he once was. Many will claim USADA has changed the game and that it has affected fighters like Pettis and Johny Hendricks, but then again, it's hard to say for sure. It could be that Pettis just peaked at an earlier age and he's now suffering from a decline in what should be his prime years. To be fair, Pettis is only losing to top fighters, but the way he's been losing is concerning, as after having not been finished in the first decade of his career, he's now been knocked out in two of his last three fights. I'd like to say Pettis is a great fighter, but I don't believe that's the case any longer. I do think he was a great fighter a few years ago, and I thought he would run away with the lightweight division, but we all know how this crazy sport works. Often the unexpected happens, and it certainly has for Pettis, whose downside has come swiftly and suddenly. Once a title contender at both 155 and 145, Pettis' days of title contention are done. At this point, he needs a win to keep his spot on the roster, but with the way his career is going downwards, it might not be long until the UFC gives up on the man who was only a few years ago one of the most exciting fighters in the world. That's MMA for you.